One of the most popular courses available to families is organised at Wahooo! Waterpark in City Centre Bahrain and organisers are hopeful they can help reduce the heartache suffered each year at pools and in the sea. “Wahooo! 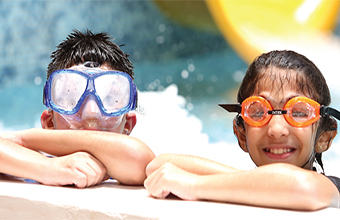 Waterpark has always been a huge advocate of water safety, and we are committed to raising awareness of the importance of basic water skills,” said Omar El Banna, marketing and sales director of the attraction’s owners’ Majid Al Futtaim- Leisure & Entertainment. All of Wahooo!’s Swim Nation instructors are internationally-qualified under the Swim Teachers Association, a globally recognised association which promotes the teaching of swimming, lifesaving and survival techniques. Children can enrol in the Kid’s Swim Nation programme, which is available for youngsters from the age of five. There are four categories for enrolment: Total Beginner, Beginner, Improvers and Advanced, and a simple assessment is conducted to determine the child’s swimming ability and level of confidence. Each term, costing BD50, comprises of 10 lessons, and each child is encouraged to develop and progress at his or her own pace. Minimum qualifications must be met before advancing to the next level, to ensure preparedness and parents are given a progress report, identifying achievements and areas of improvement. Wahooo!’s Swim Nation programme is the latest series of initiatives by the waterpark to create awareness of water safety within the community. Earlier this summer, Wahooo! hosted Bahrain’s largest swimming lesson as part of a successful worldwide attempt to create a Guinness World Record for the World’s Largest Swimming Lesson. Adult swimming lessons can be within a group setting, or alternatively, private lessons for those requiring more tailored sessions.